If you have certain medical or lifestyle factors that scare insurers away, then you will need to look for high risk insurance to cover your medical costs, car insurance and home insurance. The good news is there are options to do this; the bad news is they will cost you more. Knowing your options will allow you to find the best source for your high risk needs. Who Needs High Risk Insurance? High risk insurance applies across all areas, not just medical or auto. High risk homeowners insurance, for example, covers the cost to insure a home and its contents for a person who is deemed un-insurable by traditional standards. The person may live in an area that is not serviceable by an emergency response team, for example. The most common types of high risk insurance, though, are medical, auto and life. High risk medical insurance may be necessary for a person who has a terminal illness or pre-existing condition. High risk auto insurance is common for drivers with an alcohol-related accident or infraction on their record. High risk life insurance is required for people who work in very risky professions or engage in high-risk sports like cliff diving or bungee jumping. Where Do I Go for High Risk Insurance? Not all insurers provide high risk insurance. In fact, a number of traditional insurers will turn you away if your lifestyle factors make you too expensive to cover. However, you should know you cannot have your insurance cancelled for a reason that does not come up until after you are already insured. An auto insurer is different; if an auto insurance company finds out you received DUI ticket and criminal charge, the company may refuse to continue insuring you. If you cannot find a traditional insurer to take your policy, you will need to look to a specific high risk insurance company. Start by contacting the state board of insurance in your area. Explain your situation, and make sure your insurance company has not acted illegally by denying you coverage. Next, ask for a list of qualified high risk insurers. You should look for a company with a B+ rating or higher from A.M. Best. This minimizes the risk the company will have financial problems preventing it from covering your claims. Should I Join a Risk Pool? Risk pools are provided in 35 states as options of last resort for individuals who are otherwise un-insurable. The majority of these people are ill, but they have incomes too high to qualify them for Medicaid options. As a result, they will go on uninsured unless they join a risk pool. Risk pools will provide you coverage, but they charge you about 150% to 200% more than an average insurance company will charge you in premium. This means the cost to maintain insurance could exceed the cost to actually pay all of your claims out of pocket. 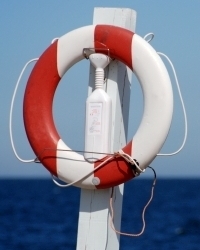 People considering joining a risk pool should do so only as a manner of last resort.